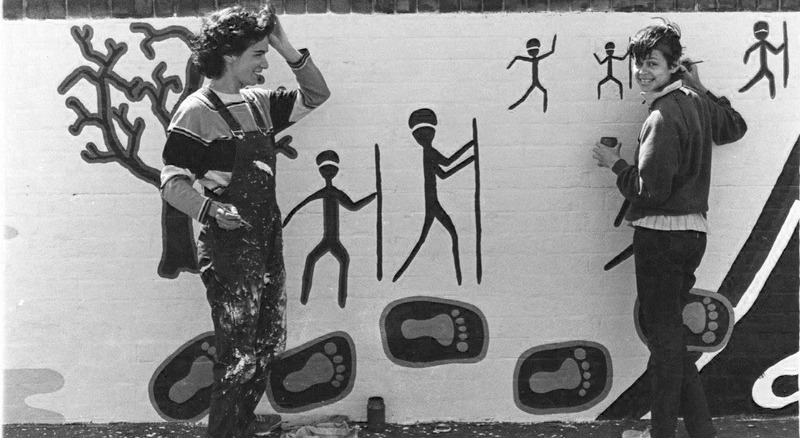 The landmark 40,000 Years mural on Lawson Street, opposite Redfern Station, was painted in 1983. 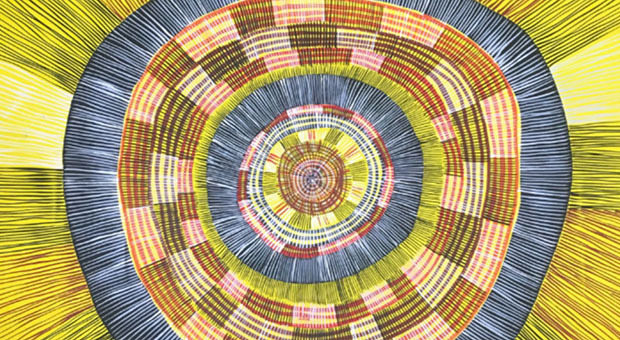 Mural artist Carol Ruff led a team of artists who collaborated with the local community to create a mural to recognise the importance of Redfern as a living and meeting place for Aboriginal and Torres Strait Islander people. Many community members, past and present, were involved in the creation of the mural. 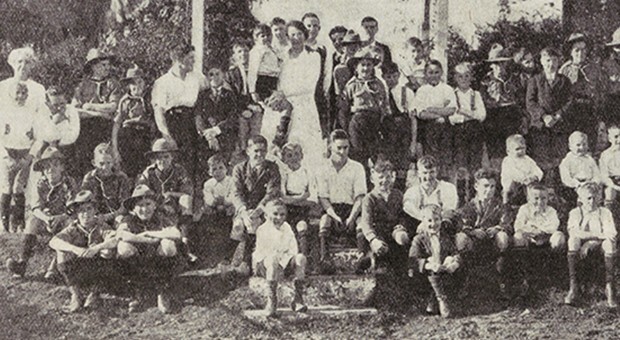 The core group of artists were Carol Ruff, Colin Nugent, Tracey Moffatt, Joe Geia, Avril Quill, Kristina Nehm and Charlie Aarons, as well as people from The Settlement and students from the Eora Centre. The mural’s title comes from a song by the same name by Joe Geia which featured on his 1988 album Yil Lull. The song is a tribute to Aboriginal people’s continuous presence and cultural connection to country. 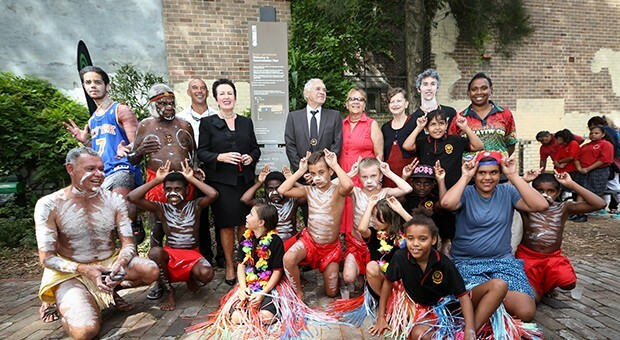 The mural presents an historic storyline that acknowledges Redfern’s Aboriginal cultural heritage, collective community spirit, resilience and pride. The mural was a community inspired and collaboratively created public artwork that enabled the desires of the Redfern community to be expressed, giving the mural its particular context and significance to the location. The mural includes scenes from Aboriginal life and culture, past and present. Footprints symbolise the journeys Aboriginal people have taken across the land before and after British invasion and colonisation. Throughout the mural are the curves of the Rainbow Serpent, the creator being. The mural also features portraits of local community members including Aunty Mona Donnelly and the Redfern All Blacks rugby league team who won the 1979 NSW Aboriginal Rugby League Knockout. 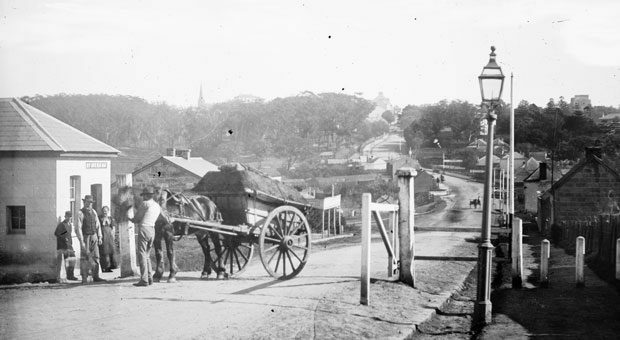 There are scenes taken from historical photographs to represent traditional and contemporary lives of Aboriginal and Torres Strait Islander peoples. The 40,000 Years mural is a historically significant public artwork for the local and broader community and is one of the few remaining original community murals in Sydney dating from the early 1980s. After 35 years, the mural is now in a deteriorated condition. There has been extensive consultation with the local community including two community meetings in September 2013, followed by the inspiring Mural Gathering Day in November 2015. At all three events, the majority decision was that funding should be raised to restore the mural to its original excellence.